Colleen Heslin, Spotting Elegance within the Chaos, 2016. Dye on canvas and linen. 96 x 130 inches. Colleen Heslin, Dr. Sarah Stanners, and Jesse Stilwell will be in attendance at the opening reception. In Studio includes 20 paintings from this remarkable Canadian Colour Field painter—five of which have never before been publicly exhibited in Canada. Conceived as an opportunity to gather these select works in a new space with the aim to spark study—in the form of looking and conversation—this exhibition presents paintings produced between 1960–73 from private and public collections from across Canada and the USA. Though raised in Montreal, Jack Bush was born in Toronto and would spend his adult life there. His art and his ambitions took his career to great heights across Canada, as well as London and, especially, New York. Included in Clement Greenberg’s seminal Post Painterly Abstraction exhibition (1964), as well as a solo show at the Museum of Fine Arts, Boston (1972), Jack Bush remains one of Canada’s most celebrated and distinguished artists. Dr. Sarah Stanners, Director of Curatorial & Collections at McMichael Canadian Art Collection, Kleinburg, co-curated the Jack Bush retrospective at the National Gallery of Canada, Ottawa (November 2014–February, 2015). Dr. Stanners is author of the forthcoming Jack Bush Paintings: A Catalogue Raisonné. 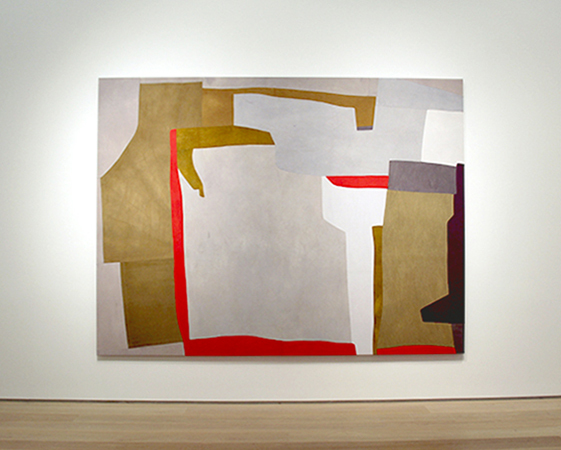 Colleen Heslin’s paintings resonate with the tension of material and gestural complexity. Successfully fusing thought and action, the work dismantles material hierarchy by providing equal space to art and craft. Considering formal abstraction and craft-based methods of mark-making, Heslin’s work thoroughly explores colour, shape, and texture. Constructed out of hand-dyed and ink-stained fabric, the work acknowledges histories of photography and textiles, and finds connections with the Colour Field painters of the 1960s and 1970s. Colleen Heslin is a Vancouver-based artist and curator. The winner of the 2013 RBC Painting Competition, her work has been exhibited and published in Canada, USA, and Europe. Heslin founded The Crying Room, a center for emerging contemporary art, in Vancouver, BC, in 1999. Chromaphoria investigates the effects of coloured light on interior space and visual perception. The illusory quality of additive colour mixing is the core concept behind this work: dazzling light sources and light-reflecting objects constantly shift and change. The installation is ephemeral, seductive, and chameleon-like, never quite the same at any one time, or from any one perspective.